All Western States entrants who finish the Run in full accordance with the rules qualify for one or more awards given in recognition of their achievement. The first official male and female runner to cross the finish line within 24 hours will be the winner of the Wendell Robie Cup, a perpetual trophy on which the victor’s name will be engraved. The first male and female finishers will each be awarded the bronze Western States Cougar Trophy. Additional age-group awards will be given to the top three men and women in the following categories: 39 and under; 40-49; 50-59; 60-69, and 70 and over. 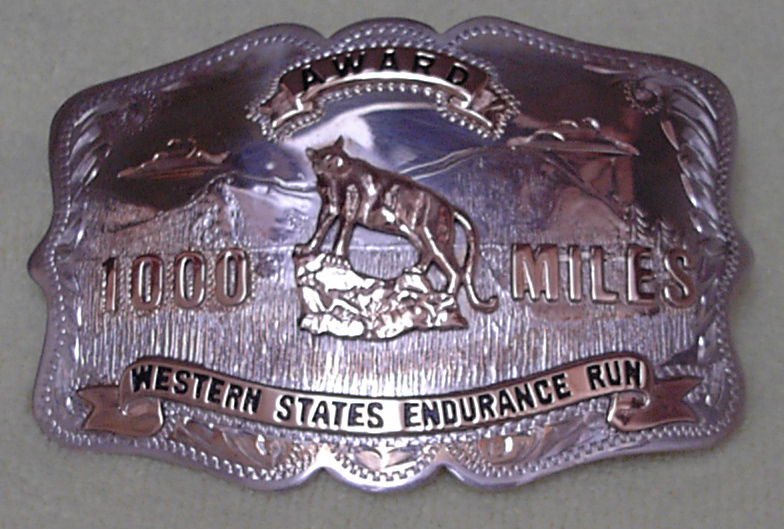 All finishers in under 24:00:00 hours will receive the hand-made silver Western States Endurance Run belt buckle. 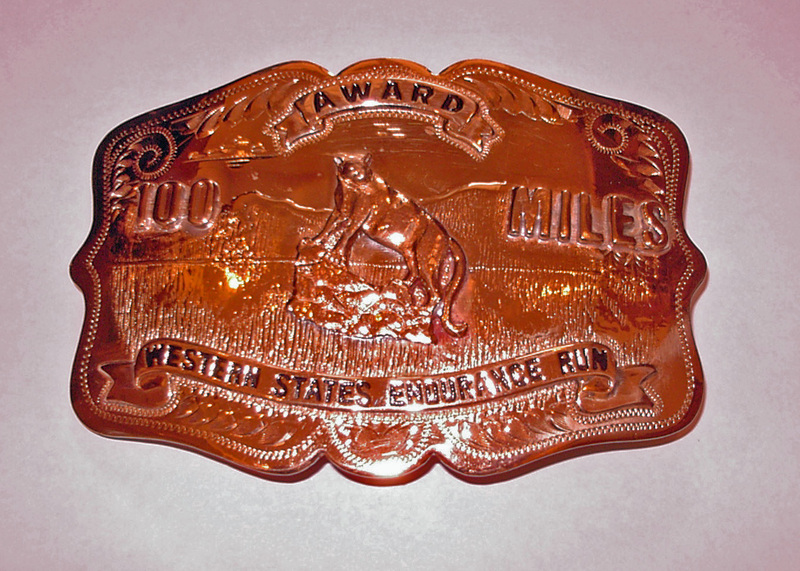 All finishers who finish in a time of 24:00:00 but under 30 hours will receive the hand-made bronze Western States Endurance Run belt buckle to commemorate their achievement. All official finishers will receive an attractive finisher’s medallion. The oldest male and female finishers will receive special awards presented by Dr. Walter and Ruth Ann Bortz. If you are unable to attend the awards ceremony, please have someone else attend in your place so they can pick up your buckle for you. If you would like your buckle mailed to you, a $35 mailing fee must be received in the WS office by September 1st. All requests and fees must be received by the September 1st deadline. The Silver Buckle is perhaps the most coveted award in ultrarunning. With roots going back to the award given out to finishers of the Tevis Ride, the belt buckle has now become the standard for 100 mile races in the US. Some shorter races even award buckles to finishers. The Western States Silver Buckle has been hand crafted by the family run business Comstock Heritage in Carson City, NV since the beginning. Below is a picture of the buckle given to the winner. All sub-24 hour finishers receive a similar buckle. Note that because these are handcrafted, no two buckles will look exactly alike. 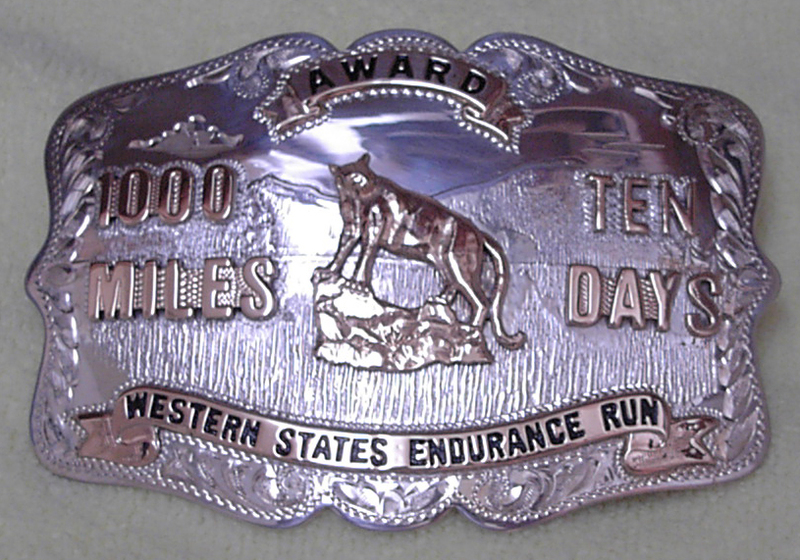 For the first three years of the race, similar to the Tevis, a finisher buckle was only awarded to sub-24 hour finishers. However, thanks to Peter Mattei and Ralph Paffenbarger, who in 1977 continued on after all the other runners had either finished, dropped, or were “too late” and finished in then-unofficial 28:36, the idea of a 30-hour Bronze Buckle was born. In 2012 we traveled to Comstock Heritage and were fortunate to be able to learn and watch how the Western States finisher buckles are made. Below is the video we shot of the process. In addition to the Silver and Bronze Buckles awarded to a finishers each year, there are a couple of milestone buckles given to multi-year finishers. 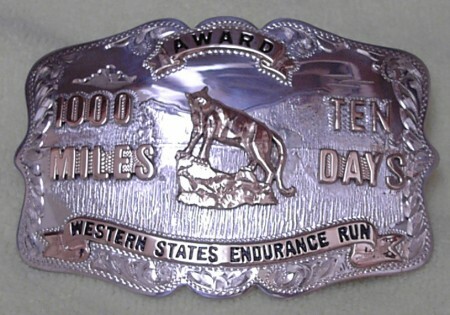 If a runner completes Western States ten times all under 24 hours they are awarded a 1000 mile/ten days buckle. 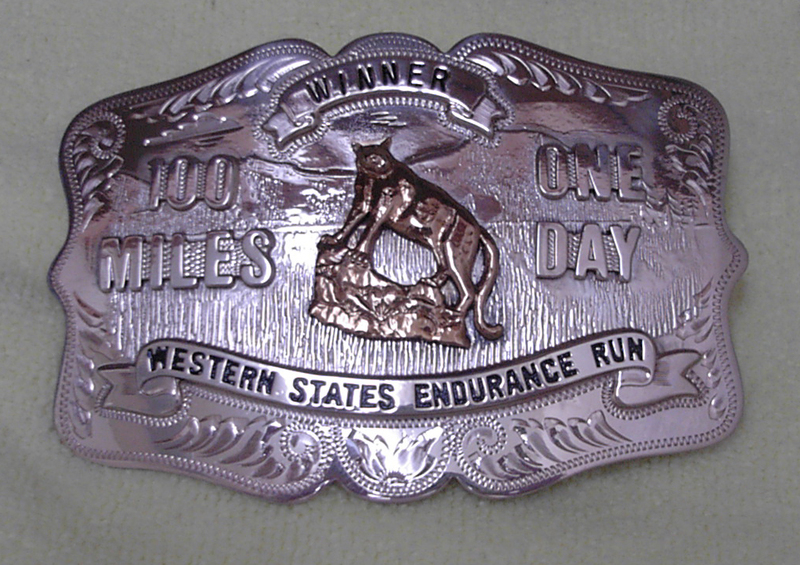 If a runner completes Western States ten times but not all of his/her finishes are sub-24 hours, the runner is awarded a 1000-mile buckle. 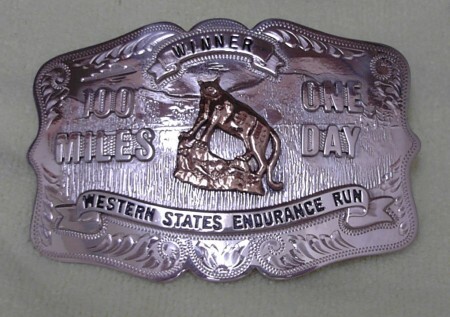 There have also been a couple of runners who have finished Western States 20 times and one runner who has finished the race 25 times, and they are awarded 2000-mile and 2500-mile buckles similar to the 1000-mile buckles. See the Records page for all the multi-year buckle winners. The male and female winners, in addition to having their names engraved on the perpetual trophy, are awarded Bronze Cougar sculptures. 2011 Champions Kilian Jornet and Ellie Greenwood holding their cougar trophies.